Brothers are often quickly distinguishable by a common surname. Those who have defended and preserved freedom have such a name in common. We are identified as "Veterans". Within the family of America's veteran population you can find men and women who mirror all areas of family life. There are the leaders who guided us and prepared us for what was to come. These leaders can take on an almost paternal or maternal shape in our memories. We have those members of our family who stand out and make us proud, and we also have our "black sheep of the family" who may from time to time embarrass us. But we are family all the same. When we think of the "brotherhood" that exists among veterans, it is usually the stronger, older brother that stands out. We remember our older brothers for their strength, for the way they "taught us the ropes", the way they stood up for us when we needed an ally. Delbert Schmeling was the kind of young soldier that would have been easy to think of as a younger brother, the one that needed a big brother to look out for him. He refers to himself as his home town's "Forrest Gump". At first there seems to be little in common between Delbert and the fictional character of the popular movie. 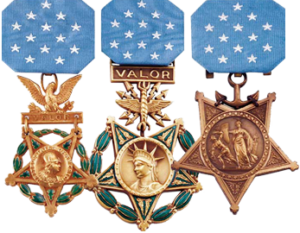 In the movie, Forrest Gump is a hero who receives the Medal of Honor. Delbert Schmeling completed his tour of Vietnam duty having never even had to fire his M-16 rifle. Forrest Gump was a combat infantryman fighting the enemy in the field, Delbert was a "sanitation engineer" cleaning the field latrines for other soldiers. When you begin to talk with Delbert, the similarities become more noticeable. Delbert talks with the same, slow drawl we recognized with the line, "Life is like a box of chocolates". His words reflect the same kind of simple logic. Upon meeting Delbert, many people would gain a first impression that he is handicapped. Delbert himself admits that he is a little slow mentally. Because of his struggle with Post Traumatic Stress Disorder (PTSD), Delbert IS considered 100% disabled by the Veterans Administration. But handicapped? No way. Delbert is the "kid brother" who grew up, and never forgot his "big" brothers. Would to God there were more heroes like him. Perhaps Forrest Gump should have characterized himself as his own home town's Delbert Schmeling! "All my buddies are heroes. It ain't right to forget them. I miss all of them." 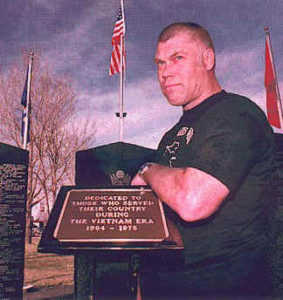 It was just prior to Veteran's Day, November 2, 1996 as my wife and I drove to the new Vietnam War memorial in our home town of Pueblo, Colorado. This was the day the memorial was to be dedicated. And, though it was located in Pueblo, the monument itself was the Colorado State Vietnam Veterans Memorial. It was heartwarming to see the crowd that had already gathered as I parked the car. Hundreds of Vietnam veterans were quickly identified by their uniforms, hats, or patches. It was also a "high profile" crowd including state legislators and virtually every one of our city officials. It promised to be a ceremony all of us would be proud to be a part of. From a distance I could see the three, 8-foot granite slabs that contained the names of the 620 Colorado men and women who had died in Vietnam. Above them flew the National Colors, the flags of each branch of service, and the POW/MIA flag. It looked just like the diagram Delbert Schmeling had shown me three years earlier. That thought caused me to cringe inside, first in embarrassment, then in shame. Delbert had kind of looked up to me as a "big brother". I first met him when he and his parents attended a rather large, patriotic celebration I had organized that included several Medal of Honor recipients. At the conclusion of the event Delbert had walked up to tell me how impressed he was with our program. "You know," he told me, "If you can put together something this big, maybe you can help me with a project I am working on." I courteously invited him to call to make an appointment to discuss his project. "I will," he replied. And he did, the very next week. As I set coffee for the two of us on the desk in my office, Delbert began withdrawing pages of plans, designs, and a list of names. He explained that it represented a dream for a local memorial to honor his brothers and sisters from Colorado who had died in Vietnam. I appreciated the concept, but couldn't bring myself to believe in its viability. The project had been started by the local chapter of the Vietnam Veterans of America (VVA) which disbanded shortly thereafter. By "default" Delbert became president of the non-existent chapter and the sole hope for the future of the project. I thought to myself, "If a whole chapter of Vietnam Vets couldn't get this done, there is no way Delbert will ever pull it off." Of course I didn't say that out loud, I went out of my way to be patronizing...the big brother offering encouragement while knowing "the kid" was dreaming "pie in the sky". I felt a strong sense of compassion for Delbert as we talked. His appearance, the difficulty he had with speech, and other mannerisms initially give one an impression that he may have been severely wounded in Vietnam. That afternoon Delbert opened up to me and began to share a little about himself. There are those that would argue that Delbert should never have been in the military in the first place, much less Vietnam. His learning difficulties as a child left him far behind his classmates. He graduated from high school two years behind other young people his age. But Delbert had hung in there, never given up and ultimately, graduated. He hadn't realized when he turned 18 that he was required to register for the Selective Service. He was shaken when someone told him that he could go to jail for not registering. Delbert, ever mindful to do the right thing, registered immediately. 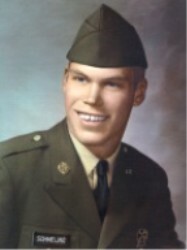 Upon finishing high school in 1967 Delbert felt the right thing to do was to serve his country. He volunteered to join the Navy, but they weren't interested in Delbert Schmeling. By November, however, the Army had enlisted Delbert and sent him to training. Ten months later he arrived in Vietnam. "I would have been there sooner," Delbert says, "but I had to go through basic training three times." Delbert never saw combat in the field, but Vietnam had its way of working into your consciousness where ever you might be. For 365 days Delbert literally slept with his M-16 rifle, prepared for whatever may come. He tasted death, watched friends die in an explosion and fire on the base camp. On his last night "in country" the enemy reached out one more time. That night Delbert huddled in a bunker with other soldiers as a major rocket attack was launched against his position. Throughout the night he never knew from one minute to the next if he would be walking onto the "Freedom Bird" home the next day, or if others would carry his body to the belly of a cargo plane for the return home. Men died around him that night. "They wouldn't tell me who died," he says. "Maybe I didn't really want to know." Delbert came home to try and put his life back together. But Vietnam would invade his dreams. Many nights he would awaken screaming, his body shaking and covered with sweat. For 14 years he worked at menial tasks on the housekeeping staff at the Colorado State Hospital. But the inner demons plagued him time and again until Delbert finally broke down. After six months in a VA hospital, Delbert was diagnosed with PTSD and determined to be 40% disabled. Two years later the VA re-evaluated him and granted 100% disability. Back home with his parents, Delbert struggled to survive the bad days, and find a sense of purpose in his few good days. He found some comfort and understanding among fellow Vietnam Vets in the local VVA before the group disbanded. When they were gone, Delbert determined to follow through with the dream of building a memorial to all his Colorado brothers and sisters who had died in Vietnam. When Delbert left my office that day back in 1993 my mind was flooded with a mix of emotion. I couldn't help but admire the courage and determination in my "kid brother". Part of me wanted to reach out and help, do what I could do to help Delbert make the dream come true. The "rational" side of me was more inclined to spend my time on "more attainable" goals. In the years that followed Delbert would call or visit me from time to time, but sadly, I never took the time to pay attention to how much he was doing. I'd pat him on the back, give him a few words of encouragement, then send him off to accomplish his mission, alone. And that is exactly what Delbert had done. The kid who had so much trouble forming speech in normal conversation, had stood alone before City Council and city leaders to promote his project. He sat in front of local grocery stores for three years with a small glass jar to collect nickels, dimes, and quarters to make the dream happen. He collected aluminum cans, visited businesses, and solicited help where ever he could. He translated his list of names to an identifiable format for creation of the three granite slabs after obtaining a commitment from a local company to donate their time inscribing those names. He paced off an area allocated by City Council for a memorial site, dug up snow covered dirt, and staked off areas for concrete masons and contractors. His drive, his dedication, and his determination to remember his comrades struck a nerve at City Hall. City Manager Lew Quigley became a "second-father", coaching and helping where he could. Council members could not help being moved by his commitment to the project. And now, just a week before Veteran's day, the fruit of his labors became a source of pride for our whole city. The dedication of the memorial that day was moving and emotional. Elderly mothers gently ran their fingers across the engraved names of Colorado sons and daughters who had answered their Country's call and paid the supreme sacrifice. Others left flowers, mementos, and tears at the base of the three granite panels. Medal of Honor recipient Peter Lemon presented the keynote address, stopping from time to time to wipe tears from his eyes and clear his throat. Colorado State VVA president Carl Rust summed up the meaning of the event. In conclusion he pointed to the dedication of the solitary figure who had made it happen. "We all thank you, Delbert, for a job well done. You are relieved of your duty." It summed up how we all felt about Delbert, a good soldier who had done what none of us had thought possible. Delbert accepted the accolades with modest humility, giving credit to others, when we all knew full well that HE was the reason it had come to pass. Delbert Schmeling had become, in his own simple way, a hero to all of us. By the time the ceremony had ended my feelings of shame at not having been a better "big brother" to Delbert had been replaced by an immense sense of gratitude and pride in what he had accomplished. I couldn't wait to go up and give him a big, brotherly hug and tell him how proud I was of him. And then, as his head rested on my shoulders I felt him begin to shake and realized he was crying. "What's wrong, Delbert?" I asked. "They're taking away my pension," he replied. Yes, the Veterans Administration had also been impressed with what Delbert had accomplished. They had re-evaluated his condition and the previous week he had received a letter informing him that his pension would be cut by more than $900 per month. Their reasoning? Any person who could spend three years raising the funds, coordinating the work, organizing the details, and accomplishing a feat as wonderful as the new Colorado State Vietnam Veterans Memorial couldn't possibly be disabled. They cited another evidence of his "improved condition". In 1994 Delbert didn't know who the President of the United States was. Now, when asked, he could identify the President as "Slick Willie". Despite the blow, Delbert made it plain that he didn't regret what he had done. He was quick to point out that even if it meant the loss of his pension, he would do it all over again so that others would not forget the sacrifice of his friends in Vietnam. Delbert had filled a void in our veterans community, now he needed a big brother more than ever before. And we came, in force! Senator Ben Nighthorse Campbell, himself a veteran, sent a letter to the director of the US Department of Veterans Affairs pointing out that Delbert's pension was being cut "because he raised money for a Vietnam memorial in Pueblo." The local media, which had gained a wonderful sense of respect for Delbert, was quick to point out the irony of this Vietnam veteran coming under fire, not by a foreign enemy, but by his own country. Mr. Lemon began to make calls and write letters. We all rallied around the cause of our younger brother, our hero, Delbert Schmeling. In the end, we prevailed. It was the right thing to do! Delbert's commitment to his brothers and sisters in arms has been a lesson to all of us. Over the last three years there has seldom been a day he has not visited the memorial. He tends the landscape, polishes the stone, and regularly provides fresh flowers from his mother's garden. He is a daily volunteer at the local VA clinic, and frequently drives the four hour round trip to take less fortunate veterans to the nearest VA hospital in Fort Lyons. The man who I always thought of as a "kid brother" is proving to be the biggest of us all. We need him far more than he needs us. I hope and pray that I can be half the man he is today. Recently while visiting with Delbert in putting this story together he looked at me and said, "Doug, maybe you can help me with a project I am working on." I smiled inwardly and thought to myself, "Where have I heard those words before." "You know," Delbert said, "There is lots of space near the Vietnam memorial, and we need to do something to remember our Korean War Veterans................."